SACRAMENTO, Calif. (AP) — A utility facing severe financial pressure amid speculation its equipment may have sparked a deadly Northern California wildfire asked U.S. energy regulators last month for permission to raise its customers’ monthly bills to harden its system against wildfires and deliver a sizable increase in profits to shareholders. San Francisco-based PG&E — one of the nation’s largest electric utilities serving most of Northern and central California — made the request a month before the Camp Fire broke out Nov. 8 and quickly ballooned into the deadliest U.S. wildfire in a century. No cause has been determined, but speculation has centered on PG&E, which reported an outage around when and where the fire ignited. PG&E already faced financial pressure from its suspected role in a series of deadly fires in California wine country last year. The company’s filing last month said it needed to boost revenue to keep investors from fleeing, noting that its credit rating was downgraded and its shares had plummeted since the 2017 fires. 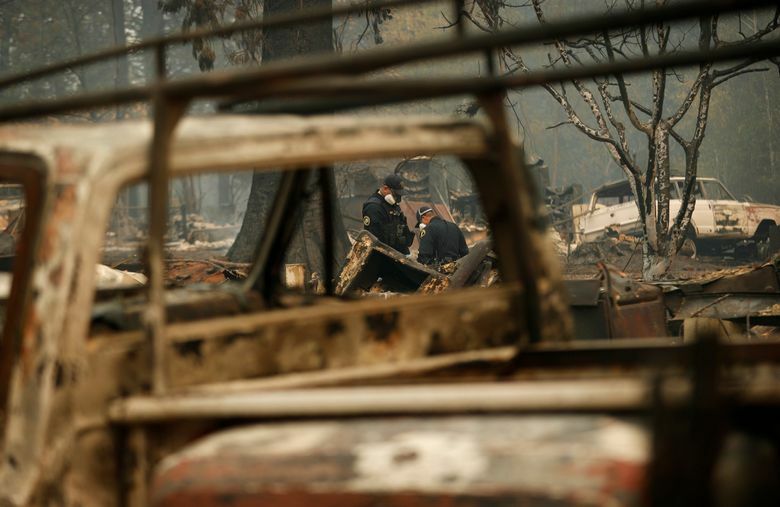 Wildfires threaten PG&E’s ability to attract and maintain the investment necessary to support its system and meet California’s clean energy goals, company spokeswoman Lynsey Paulo said. “PG&E’s electrical system is not immune from the impact of increases in the frequency and severity of extreme weather,” Paulo said. PG&E shares rebounded in after-hours trading, regaining Thursday’s losses but remaining far below their value when the fire broke out. “It’s going to be very difficult for PG&E to finance its needs in the short run, so we think at this point, regulators need to step in and give the market some reassurance,” said Travis Miller, a strategist at Morningstar. Advocates for utility customers have balked at PG&E’s contention that it needs to raise rates because of wildfires. They say its problems are the result of poor management decisions. “We don’t pay electric bills in order to keep bailing PG&E out from its own negligence and incompetence, and we can’t afford it,” said Mindy Spatt, communications director for The Utility Reform Network. PG&E reported to the Securities and Exchange Commission this week that it had renewed its insurance coverage for wildfires to about $1.4 billion for the year covering this fire season. But an analyst at Citi Investment Research estimated damages could exceed $15 billion. And the company’s potential liability for last year’s fires has been pegged at upward of $10 billion. Some analysts believe PG&E will be able to survive financially as long as there isn’t another major catastrophe. 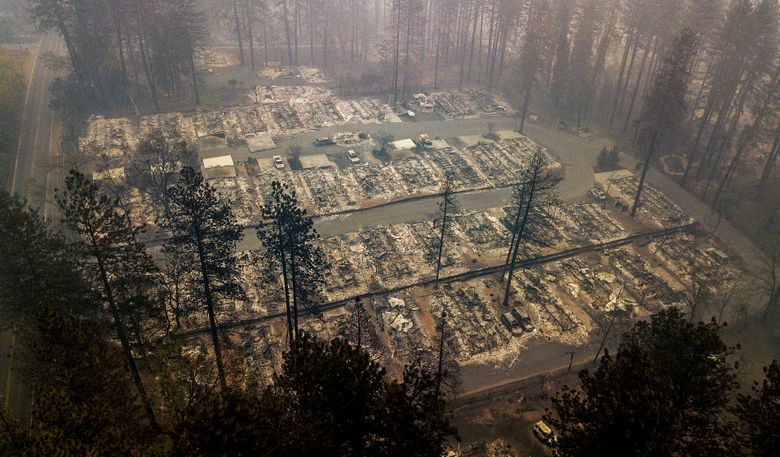 But wildfires are getting bigger, deadlier and more destructive as housing pushes into rural areas and drought and high temperatures tied to climate change become the norm. PG&E’s ability to raise capital will be constrained, so it will probably be forced to cut back on expenses such as replacing aging equipment, analysts said. California utilities also need to invest in the type of upgrades that will allow the state to meet its aggressive renewable energy and carbon reduction goals. Fire investigators have blamed PG&E equipment for 12 of last year’s wildfires, including two that killed 15 people combined. In eight of those fires, investigators said they found evidence of violations of state law and forwarded the findings to prosecutors. California regulators generally allow utilities to pass on the costs of those lawsuits to their customers, but only if the company can show it prudently managed its equipment. The new state law makes it easier for utilities to bill customers if they can show a fire got worse from things outside their control, like severe weather. But lawmakers didn’t drop the standard that puts all the liability on the utility, which is unique to two states. “Very large damage payments of the size faced by California utilities are very unusual in other states,” said Hugh Wynne of Sector and Sovereign Research, an investment research firm.